Is Glycerin the Toxin in Chicken Jerky Treats? Jatropha toxicity. Is Glycerin the Toxin in Chicken Jerky Treats? - The Intriguing Story. By now you have likely heard of the concern that chicken jerky treats are making dogs sick. Almost two years ago, the Canadian Veterinary Medical Association put out a statement advising veterinarians that there had been several reported cases of dogs getting sick after eating chicken jerky treats. The common thread amongst these cases was that these treats were manufactured in China. These problems are not limited to Canada. The FDA, in the USA, has received thousands of complaints of dogs becoming ill after eating chicken jerky. Some of these dogs have been extremely ill to the point of requiring hospitalization and some have died. This is a very serious matter. Chicken Jerky From China May Be Causing Fanconi Syndrome in Dogs. Chicken Jerky Recall Due To Antibiotic Residue. Extensive FDA Testing on Chicken Jerky. Despite the large number cases being reported, the FDA has not been able to demand a recall of any of these treats. (There was a recall on some chicken jerky treats tainted by antibiotic residue, but this recall is not connected to the many cases of dogs getting sick.) Even though it is clear that dogs are getting very ill from eating chicken jerky, they can only force a recall if they can find something on which to blame the illnesses! They have run many, many tests looking for pesticides, heavy metals, bacteria, and many more possible culprits but have not been able to identify what is causing the problem. Recently, recalls were announced on several brands of chicken jerky treats, (Milos, Waggin' Train, and Canyon Creek) because small amounts of antibiotic residue were found in the treats. However, the FDA was quick to proclaim that this incident was unlikely to be connected to the many chicken jerky illnesses and deaths reported in the last few years. 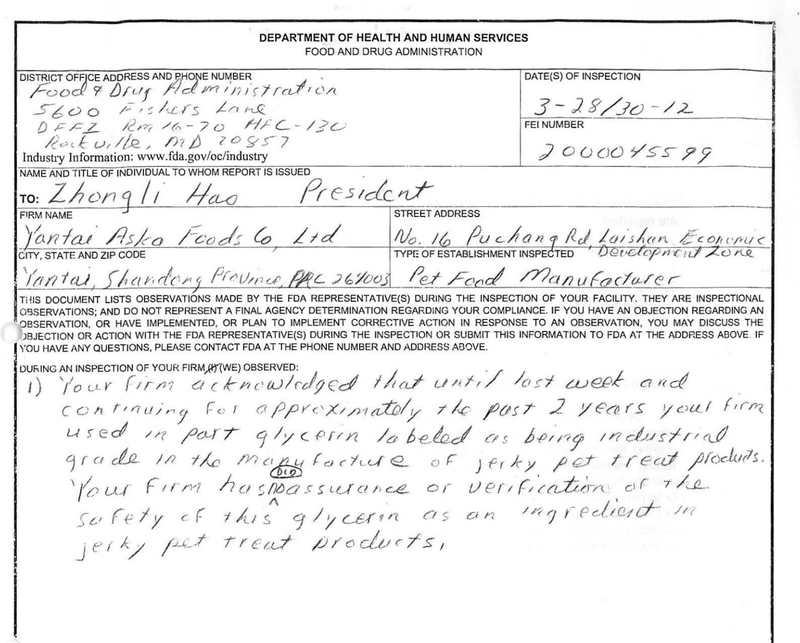 As part of the FDA's thorough investigation into why these treats are making dogs sick, they have even travelled to China to thoroughly examine the factories in which these treats are made. And finally, this week, they revealed findings about something which may be a clue....glycerin. Glycerin is described by Waggin Train as being a "natural flavor used to retain moisture so your dog gets a premium taste experience." Glycerin in food products generally is nontoxic. Food grade glycerin is made from vegetable oils such as palm oil and vegetable oil. Eating large amounts of vegetable glycerin can cause some stomach upset, but the small amount of glycerin in dog treats is very unlikely to cause the serious illnesses that we have been seeing....or is it? Is this glycerin really food grade? A 49 page report on their findings can be found here. It is a fascinating read! After inspecting the plant, the FDA found one serious issue. The company was using glycerin that was labelled as industrial grade and NOT food grade! They have been using this particular brand of glycerin for the last two years. ..I questioned whether the firm had ever conducted any testing on the glycerin to verify it was food grade. Mr. Jiang acknowledged that the firm had not done any such testing. Mr. Jiang then asked that I not include this incident in my report. So, the Yantai Aska Foods plant was using industrial grade glycerin rather than food grade glycerin! Or were they? "Falsely labelled as industrial grade"
The company claims that the glycerin truly was food grade glycerin but was simply labelled as industrial grade. Why? Because industrial grade glycerin is much more expensive to import. In 2007, there were several deaths in people who had ingested cough syrups containing glycerin that had been contaminated with diethylene glycol. Since then, any glycerin that is meant for use in food or in pharmaceuticals must go through very strict testing. The result is that the price of food grade glycerin became much more expensive than industrial grade glycerin. For this reason, the Yantai Aska Foods plant asked its supplier to falsely label their vats of glycerin as industrial grade. The company claimed that they only used natural ingredients like palm kernel oil and palm stearine as the materials for their glycerin. All glycerin manufactured and exported by the firm meets Food Chemical Codex (FCC) and USP standards of 99.5% minimum glycerin. Translation -- this is food grade glycerin. Typically misbranding happens when a company labels an inferior product as a superior product, whereas in this case the firm was labeling a superior grade of product as inferior. They replied that they were only following their customers' request for shipping marks on the containers. Mislabeling the containers is obvious deception and does not do much for the reputation of the company that makes this glycerin. Is it possible that there are other nefarious actions going on at this factory? I think it certainly is possible. But still, nothing can be proven. What if there really was industrial glycerin being used? I think it is conceivably possible that some of the glycerin that is being shipped to Yantai Aska Foods and is incorporated into chicken, beef and duck jerky treats is actually not food grade, but industrial grade glycerin. If this was the case, then how would it cause dogs to get sick? One may think that the same problem could be happening as in 2007 and that the glycerin was contaminated with ethylene glycol. Ethylene glycol causes severe kidney damage and ingestion can definitely make dogs sick and even be fatal. However, the FDA has run extensive testing on bags of treats that had made dogs sick. They looked specifically for ethylene glycol and similar contaminants and have not found any. As I was researching industrial glycerin, I came across something very interesting. Industrial glycerin is often obtained as a byproduct of making biodesel fuel. In the last few years, makers of biodiesel fuel have started using a plant called Jatropha as one of the ingredients of this fuel. The main reason for this is that extracting oil from the Jatropha plant is relatively inexpensive. When biodesel fuel is made, the oil is extracted, and what remains is glycerin. This type of glycerin is industrial glycerin and not meant for use in food or pharmaceutical products. The interesting thing is that the Jatropha plant is very toxic! This study showed that humans who ate just a small number of Jatropha seeds had severe episodes of projectile vomiting followed by abdominal pain and then diarrhea. A similar report of humans getting sick after eating Jatropha seeds claimed that children who ate the seeds had severe vomiting, diarrhea, dehydration and liver and kidney damage. It also stated that death was a possibility after ingesting Jatropha. This study looked at sheep and goats that had eaten Jatropha seeds. They noted severe diarrhea, and inappetance. Post mortem exams showed severe hemorragic damage to the intestinal tract as well as changes in the liver and other organs. These symptoms are very similar to what has happened to a number of dogs who have been sickened by jerky treats. Jatropha is nasty stuff! It is extremely toxic! If Jatropha was present in chicken jerky treats then it is definitely possible that this could be the cause of so many dogs' illnesses. However, the FDA has received many many samples of potentially contaminated bags of treats and have not found a toxin. So can Jatropha laden glycerin still be the culprit? Would they not have found this in their many tests? As it stands today, there is no reliable test for Jatropha! As such, many of these treats could contain Jatropha which can make dogs extremely sick! The FDA is working to develop test methods for Jatropha based ingredients. They have also asked other researchers to share with them if they have methods to detect Jatropha. It is my guess that once these tests are developed, they will eventually be able to find that Jatropha is actually present in the contaminated jerky treats. 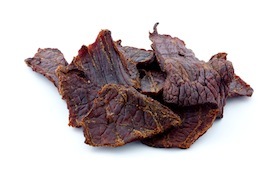 At that point they will officially be able to recall any chicken jerky, beef jerky or duck jerky treats that were produced by the Yantai Aska Foods company and any other company that uses glycerin produced by Acidchem International. Until then, the FDA continues to warn people to stay away from all forms of jerky treats for pets that are made with ingredients from China. Please spread the word. These treats continue to be available on the shelf of most pet stores. 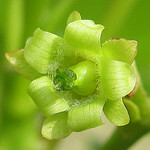 Jatropha photo courtesy tonrulken, flickr. Chicken, Beef and Duck Jerky treats have been making dogs very sick. Want to make your own chicken jerky? Dr. V. shows you how in this video. You can read the full instructions here.